I am a usually a very introspective person when it comes to my viewership of art. Yet, an incredible opportunity presented itself which allowed me not only to come out of my shell but experience art in a completely different way. Thank you H from Three Pipe Problem for your incredible insight. Ever since the day I stumbled upon the Three Pipe Problem in search of a certain Botticelli picture, I have been following your blog religiously, it was such an honor to spend the morning with you at the Pitti Palace. Inspired by H, I have decided to present this entry with a new perspective. Although my blog mostly covers museum viewership and reactions, I have decided to go in a new direction for this entry in tribute to the Three Pipe Problem. 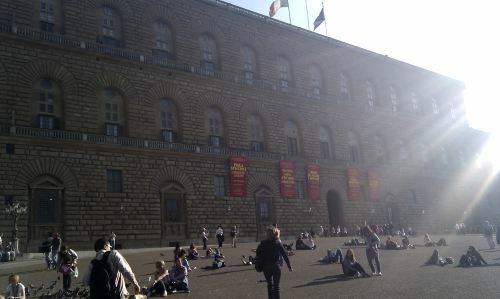 The Palazzo Pitti is grandeur personified, it is an aesthetic and societal biosphere made up of many dimensions. From the silverware, modern art and palatine galleries to the Boboli gardens, this palace of mass exuberance is one step below Versailles. I have never been a fan of the Rococo and gilded splendor so it was no surprise upon entrance to the palatine galleries that I was blinded by the overly gaudy décor. Gold leafed walls, frescoed ceilings and antiquities of gilded splendor encompassed the interiors of the palatine galleries. Although my main focus on this entry is set on a particular piece and not the palatine galleries themselves. In my opinion, less is more when it comes to the exhibition of art. 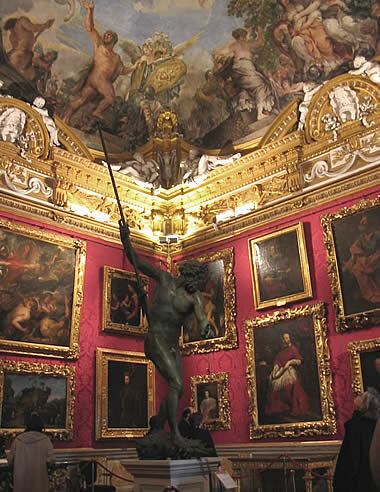 However, upon viewership of the interior palace it appeared the Medici failed to acknowledge simplicity and wished to display the best of everything, thereby overly congesting the art works within each room. While I walked the halls of the palatine galleries with H, I wanted to experience the details and styles of each renaissance artist however I found myself overly distracted due to all of the works crowded within each room. As mentioned in previous entries, I dislike guided tours because I wish to experience art introspectively but I found myself in tune with H for I sought to ingest all the knowledge H had to offer, I wanted to know more about the Carravagisti and the Raphaels, as well as any other artists that came up in discussion. There weren’t many tourists in the gallery and we talked throughout our entire viewing experience. Yet, there was one moment when I went silent, that moment was brought on by the viewership of the Bartolini Tondo. The Bartolini Tondo by Filippo Lippi is housed in Room XXI of the Palatine Galleries. It is displayed on the back wall of the room is showcased by its large scale size and opulent frame. I was immediately drawn to this work and was at a loss for words, all I could do was stare in amazement. I attribute my amazement to the history behind this immaculate tondo. The Bartolini Tondo was the earliest form of a renaissance tondo, or painting presented in a round format. Prior to its creation, Renaissance paintings were created in panels or in the style of frescoes but never set as a round. However, Lippi’s tondo led a revolution of tondos to follow, as seen in the rounds by Botticelli and Michelangelo. 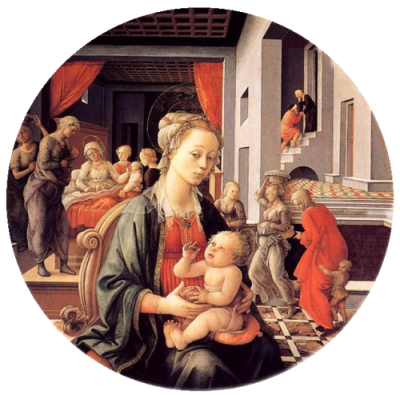 The tondo was commissioned by the noble silk merchant Roberto Bartolini, with the purposeful shape of a birthing tray to honor the birth of his first born child. It serves as a celebration of birth and matrilineal lineage. It depicts a Madonna and Child intertwined with scenes from the lives of her mother St. Anne. The Virgin serves as a focal point in the foreground while her birth and conception are displayed in the background. Lippi’s tondo is alluring not only in a religious and societal context but also as a work of incredible craftsmanship through its architecture and proportions. I was very fortunate to be amongst a fellow art lover while having such an aesthetic experience, I am rather inclined to Lippi in general since he was the mentor of Botticelli but I often undermined him for Botticelli, I now hold a deeper appreciation for Lippi as well as subjective art viewership. Thank you H and my fellow readers for following my blog and watching me grow in my aesthetic experience. Great post, Gianna! I enjoyed learning more about the tondo shape. I'm familiar with other tondi, but I didn't know that the shape was associated with the practical function of a birthing tray! That's very interesting. Sounds like you had a great experience with the painting. I love when special moments occur with a work of art, especially when you don't anticipate having such a special experience. I agree about the Pitti. It is just too much to take in. Still, it must have been great fun touring with someone who shared your interest. About the Lippi Tondo: I can see the encounter of Joachim and Anne on the stairs (Golden Gate) in the right background; as well as the birth of the Virgin Mary on the left mid ground. But who are the three women on the right? The one in red would appear to be Mary's cousin, Elizabeth, with her young son, John. But who are the other two? Also, did you notice the absence of St. Joseph? Compare Lippi's tondo with Michelangelo's Doni Tondo where Joseph plays such an important role. The role of Joseph in Christian devotion became increasingly important in the last decade of the Quattrocento. Cheers M and Frank for your wonderful comments. @Frank - That sounds like something you could do a post on, looking at that work and related pieces' symbolism in a bit more detail. Your knowledge of Christian iconography is astrounding. As you know, my key area of interest are classical/pagan symbols so am always at a bit of a disadvantage when beholding clearly religious works.